The main focus of our work at the Nuffield Laboratory of Ophthalmology University of Oxford is to identify potential new treatments for patients with incurable retinal degenerations. The scope of this work is therefore both laboratory-based and clinical, because although we need to identify new treatments in the laboratory, we also need to test them in the clinical domain. Broadly this follows three themes: gene therapy, stem cell therapy and artificial vision. We are currently leading a UK multicentre retinal gene therapy clinical trial to treat choroideremia, which has recently become international. 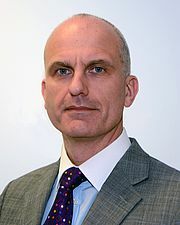 The work leading up to the trial was developed in the laboratory in collaboration with Miguel Seabra at Imperial College London and the Phase I study was funded by the Health Innovation Challenge Fund (HICF) – a joint funding partnership between the Wellcome Trust and the Department of Health. Last year the Wellcome Trust and University of Oxford set up and jointly funded a new biotech spinout company, NightstarX Ltd, which will take choroideremia gene therapy to become an approved gene therapy treatment. The name ‘Nightstar’ arose because several of our patients reported being able to see the night stars in their treated eyes a few weeks after gene therapy. We are interested in any retinal degeneration that might be treatable with adeno-associated viral (AAV) vectors. We have a programme looking at gene therapy for Best Disease in collaboration with Forbes Manson at the University of Manchester which is funded by Fight for Sight. In a previous Fight for Sight funded project we looked at the neuroprotective effects of ciliary neurotrophic factor (CNTF) delivered by AAV vector. CNTF has been around for a while and enthusiasm for it is waning because it is no longer novel. But for translational research we are always looking for treatments that have been tried and tested in the laboratory so that their effects are known, beyond all reasonable doubt. Ironically therefore, the very point at which we need to fund preclinical experiments on a new treatment is the very point at which grant applications begin to get tired due to ‘lack of novelty’. With CNTF the problem was about identifying the correct dose so that it prevented cone cell loss but without adversely affecting cone function. We developed an in vivo model that enabled us to count cone photoreceptors in a mouse model of retinal degeneration and using this enabled us to titrate the dose of CNTF precisely in vivo to the point where we were able to rescue almost all the cones without compromising visual function (Lipinski et al., 2015). By treating one eye with AAV.CNTF we prevented degeneration, which essentially led to unilateral retinitis pigmentosa (RP). It was very exciting to see this and it reminds us that sometimes the most effective recipes for new treatments can be made from ingredients that we already have in the cupboard. Novelty is the enemy of progress in translational research. ABCA4 causes a variety of retinal degenerations and any self-respecting retinal therapy laboratory would expect to have some interest in it. Since the ABCA4 transgene is too big to fit into AAV vectors, we have developed an efficient means of dividing it up into two overlapping fragments, which then recombine after retinal cell transduction. This is funded by the MRC Developmental Pathway Funding Scheme (DPFS), which is a translation-focussed funding initiative. Through a collaboration with Ilyas Washington at Columbia University in New York, we have identified an alternative molecular approach of preventing vitamin-A compounds from forming, which occurs in ABCA4 deficiency (Charbel Issa et al., 2015). This illustrates that sometimes many different approaches may be needed to treat a single disease. Figure 2: Unilateral retinitis pigmentosa in a mouse with rhodopsin deficiency and fluorescent cones treated earlier in life with 2 x 1010 genome particles of AAV.CAG.CNTF vector. 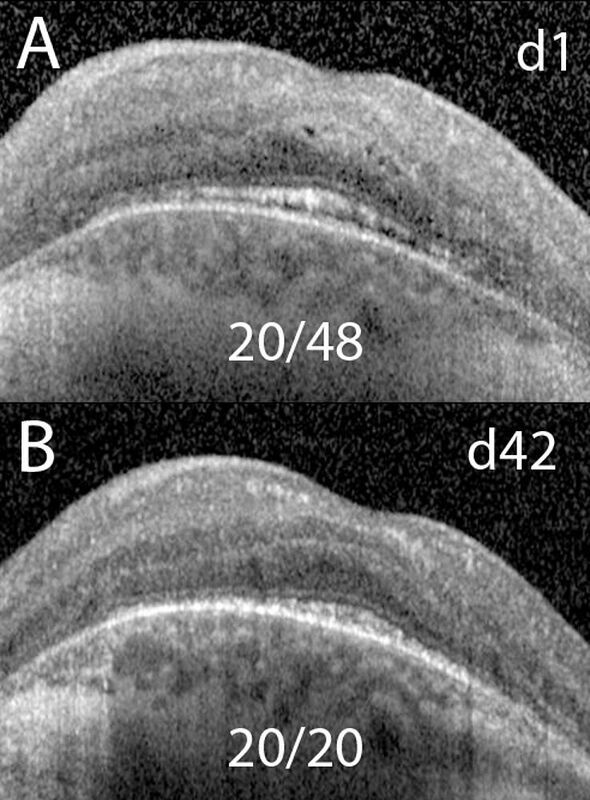 At 8 weeks (PW8) both eyes appear similar, but by 30 weeks retinal pigment changes can be seen in the sham injected eye (c) as the degeneration progresses with all cones lost (d). In contrast, the CNTF treated eye (g, h) has a virtually unchanged fundal appearance and over 50% of cones surviving (from Lipinksi et al., 2015). We are interested in the potential use of stem cells, or photoreceptor precursor cells to treat retinal disease once all photoreceptors are lost. We therefore explored ways of transplanting photoreceptor cells into the totally degenerate retina of the rd1 mouse. This work was led by Mandeep Singh as part of his PhD in Oxford, with the eventual successful aim of reconstructing the outer nuclear layer with transplanted cells in this model (Singh et al., 2013). Subsequently he was joined by Sher Aslam and Alona Cramer who began to explore other aspects of retinal cell transplantation. During this time we also noted that transplanted photoreceptors in the rd1 mouse had an abnormal profile, which made us wonder why transplanted photoreceptors appeared perfectly normal when transplanted into the wild-type or non-degenerating retina using a similar approach. It subsequently became apparent to us that the green fluorescent cells residing in the subretinal space fuse with overlying photoreceptors, with the latter taking up the green fluorescent signal as an artefact. 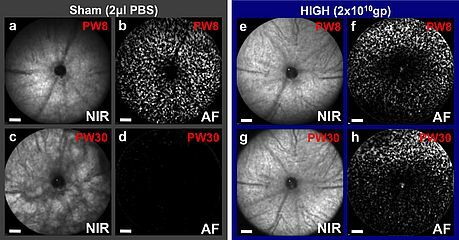 We had previously been ignoring the abnormally shaped photoreceptors lying in the subretinal space and around sites of retinal trauma, because they were not perfectly integrated in the host outer retina. Ironically these abnormal cells turned out to be the real transplanted photoreceptors and we have since been studying them profusely! This illustrates how science can lead you up the wrong path if you have a preconceived idea of what you expect your results to show. It is important to remain open-minded. We are however more interested in how to get cell replacement therapy into clinical trials and we are now collaborating with OCATA Therapeutics using human photoreceptor precursors (derived from embryonic and induced pluripotent stem cells). We have some very interesting results which will be published shortly. Figure 3: Transplanted rod photoreceptors forming a reconstructed outer nuclear layer in the rd1 mouse. Note that the transplanted cells have an abnormal profile with embryonic pattern of chromatin staining and very short outer segments (from Singh et al., 2013). Figure 4: An example of one of our patients using the IMS Alpha electronic retinal implant, developed by Retina Implant AG in Reutlingen Germany. Using the implant, this previously blind patient was able to describe the architecture of buildings and recognise ducks on the river when out walking in Oxford. The ability to restore vision is a key goal of our research programme. 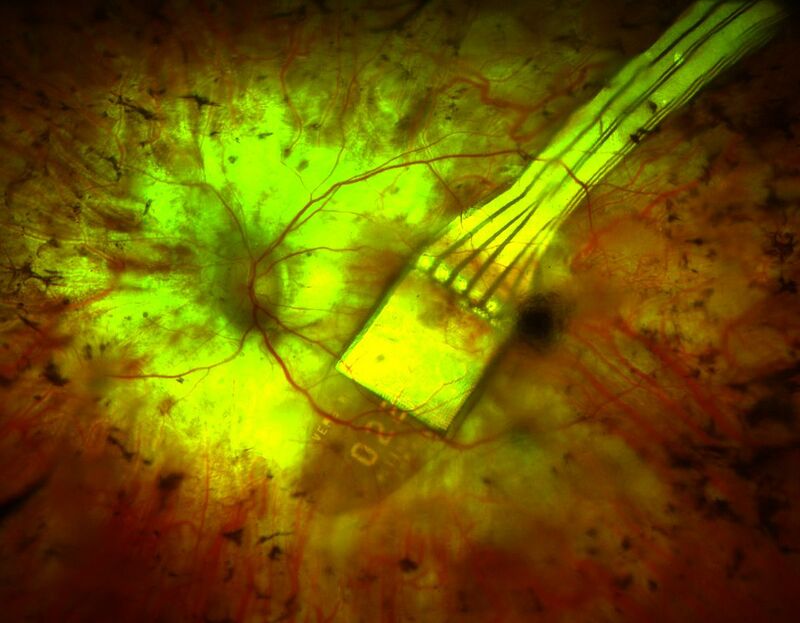 We are delighted to be collaborating with Retina Implant AG from Reutlingen in Germany on an NHS i4i Award funded project to assess the electronic retinal implant as a treatment for blindness. This pioneering work was originally developed by Eberhart Zrenner in Tübingen and has huge potential in treating patients who are blind from photoreceptor loss. Indeed we have experienced some very moving moments listening to our patients describing their new vision when the implant is switched on. It is without a doubt a very exciting time to be working in the retina field with the convergence of gene therapy, stem cells and electronic means of restoring sight. I think we are about to witness another retina ‘golden age’ of discovery, similar to when Helmholtz developed use of the ophthalmoscope. Furthermore, then as now, much of this progress is due to collaborations and good friendships between European colleagues. Stingl K, Bartz-Schmidt KU, Besch D, Chee CK, Cottriall CL, Gekeler F, Groppe M, Jackson TL, MacLaren RE, Koitschev A, Kusnyerik A, Neffendorf J, Nemeth J, Naeem MA, Peters T, Ramsden JD, Sachs H, Simpson A, Singh MS, Wilhelm B, Wong D, Zrenner E. Subretinal Visual Implant Alpha IMS - Clinical trial interim report. Vision Res. 2015;111:149-60. MacLaren RE, Groppe M, Barnard AR, Cottriall CL, Tolmachova T, Seymour L, Clark KR, During MJ, Cremers FP, Black GC, Lotery AJ, Downes SM, Webster AR, Seabra MC. Retinal gene therapy in patients with choroideremia: initial findings from a phase 1/2 clinical trial. Lancet. 2014;383:1129-37. Singh MS, Charbel Issa P, Butler R, Martin C, Lipinski DM, Sekaran S, Barnard AR, MacLaren RE. Reversal of end-stage retinal degeneration and restoration of visual function by photoreceptor transplantation. Proc Natl Acad Sci U S A. 2013;110:1101-6. Lipinski DM, Thake M, MacLaren RE. Clinical applications of retinal gene therapy. Prog Retin Eye Res. 2013;32:22-47. McClements ME, MacLaren RE. Gene therapy for retinal disease. Transl Res. 2013;161:241-54. Cramer AO, MacLaren RE. Translating induced pluripotent stem cells from bench to bedside: application to retinal diseases. Curr Gene Ther. 2013;13:139-51. Singh MS, MacLaren RE. Stem cells as a therapeutic tool for the blind: biology and future prospects. Proc Biol Sci. 2011;278:3009-16. Lee E, MacLaren RE. Sources of retinal pigment epithelium (RPE) for replacement therapy. Br J Ophthalmol. 2011;95:445-9. MacLaren RE. An analysis of retinal gene therapy clinical trials. Curr Opin Mol Ther. 2009;11:540-6.